The Faculty of Land and Food Systems will be offering a limited number of part-time TA positions during 2019 Summer Session (approximately 15-20). The application is now open. Deadline to submit an application is 4:00 pm, Friday, March 8, 2019. Please – Do not submit an application after the deadline unless you are advised to do so by an instructor or administrator. Mark your calendars – upcoming opportunities offered this term. We hope you are doing great and that the term is going well. As part of the faculty’s on-going support for your development, mark your calendars for the upcoming opportunities offered this term. Are you preparing for midterms, assignments or end of term exams? We wanted to provide a couple of Marking and Assessment Workshops to help support you in providing consistent, fair, and constructive feedback to your learners. These two sessions, one in February, one in March, will provide participants with: i) strategies to ensure that marking is consistent, ii) ways of maximizing reliability between TAs, and iii) practice providing constructive and positive feedback to learners. Snacks and refreshments will be provided. The first Marking and Assessment workshop will be held February 15th from 4-5pm in MCML 170A. Ensure a spot by registering via this link here. The second Marking and Assessment workshop will be held March 22nd, from 4-5pm FNH 300. Ensure a spot by registering via this link here. Having a space to share insights or troubleshoot issues is an important part of your professional development. Our Community of Practice space is an informal get together of TAs once month over lunch. We’ve proposed the following topics for the remainder of the term, but are always open to other suggestions for discussion or people who you want to hear from! We still have four (4) LFS TA priority (No waitlist) spots left for Instructional Skills Workshop. ISWs offered for Graduate Students at UBC are in high demand and waitlists for each workshop are typically 80–100+. Please consult this link for upcoming dates that would work for your particular schedules. Email us to reserve you spot. Nominations including application packages are now being accepted until 4:00 PM, Friday March 8, 2019 for the 2018-2019 LFS Graduate Teaching Assistant Award. Please refer to the TA Portal for further details. Friendly reminder — TA Orientation day and registration deadline. This is a friendly reminder that our TA orientation day is fast approaching. Please make sure to register so we can place an accurate catering order. Please register before January 15th by filling out this Google Form. Mark your calendars as the LFS TA Training Orientation for new and returning TAs is fast approaching! 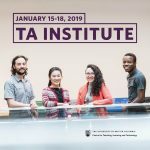 If you are TA’ing in LFS in any capacity in the 2018/2019 academic year, this training will provide all the information, connections, and expectations for you to succeed in your role. Date: Thursday, January 17th from 9:00 AM to 1:00 PM in AGORA basement – MacMillan Building. Bring your laptops or tablets with a copy of the TA Orientation Handbook (attached). To conserve paper, we will not be printing handbooks this year. You can also find the handbook online at the LFS TA Blog Portal. Dear Term 2 LFS TA‘s! connections, and expectations for you to succeed in your role. This TA position will help the instructor prepare and mark assignments based on peer-reviewed articles about molecular detection of microbes in Fermented Foods. The TA will also help mark student presentations, the midterm and the final exam. There will also be an opportunity to help the instructor with lecture material. Note: This is a two term course that runs from September to April. This position is for some or all of Term 2, to be determined (TBD). Required On-Campus Availability: Tuesdays 12:30-5 pm. Advise student groups during group work on Dairy project and community-based experiential learning activities; this includes monitoring group discussions and maintaining communication to facilitate effective group work in breakout rooms and the community. Education: Preference will be given to students who have an undergraduate degree in Land and Food Systems or environmental sciences. Experience: Preference will be given to students who have the ability to correspond effectively with the Instructor, to ask questions when uncertain about their marking responsibilities, to reliably check their work for accuracy. Skills: excellent interpersonal skills; good organizational skills; ability to set up and operate audio-visual teaching aids including LCD projector, laptop computer, and DVD player; ability to correct English usage (grammar, spelling, paragraph structure) when marking written assignments. Some experience with problem-based learning recommended. Some plant material collection for class demonstrations. Education: Preference will be given to students who have attained an undergraduate degree in Botany, First Nations Studies, Global Resource Systems or related disciplines. Experience: Preference will be given to students who have the ability to communicate with the instructor, knowledgeable of traditional plant knowledge, previous exposure to Indigenous knowledge systems, prior work experience with Aboriginal people desirable. Skills: ability to respond to student questions via web or in person. Good interpersonal and organizational skills. Knowledge of Word Press, Excel, and Connect. Effective marking skills and on-line grading tools. Responding to on-line student’s questions. Use detailed marking guide to mark two academic experiential reviews, one quiz, and a final assignment. Facilitate homeroom instruction, including discussions in break out groups and other activities. Advise students on their Community Experiential Learning Projects (CFSP: Community Food System Project); including proposal development, monitoring group progress and discussions on Connect. Marking student presentations, and group oral presentations, and monitoring student’s participation. Completion of Tri-Council Policy Statement (TCPS) on-line tutorial. Participation in a weekly preparatory meeting, one and half-hours. Education: Undergraduate degree in Land and Food Systems or environmental sciences, education, sociology, anthropology, preferred, buy not limited. One senior level undergraduate student in the Faculty of Land and Food Systems, who have completed LFS 350, may be considered for one of the TA’s positions. Skills: Excellent interpersonal and organizational skills; excellent academic writing and presentation skills; experience operating audio-visual equipment including LCD projector, laptop computer, and DVD player, and others; ability to facilitate group discussions. Some experience with problem-based learning is desirable. Hope the term is going well and that you are all doing well. Just wanted to let you all know that we have an upcoming workshop for LFS Teaching Assistants. Workshop description: In this session, participants will develop and identify emotional and cognitive skills needed for engaging in emotionally charged situations with students. We will explore a number of key strategies to build confidence and self-esteem in students when offering them feedback. 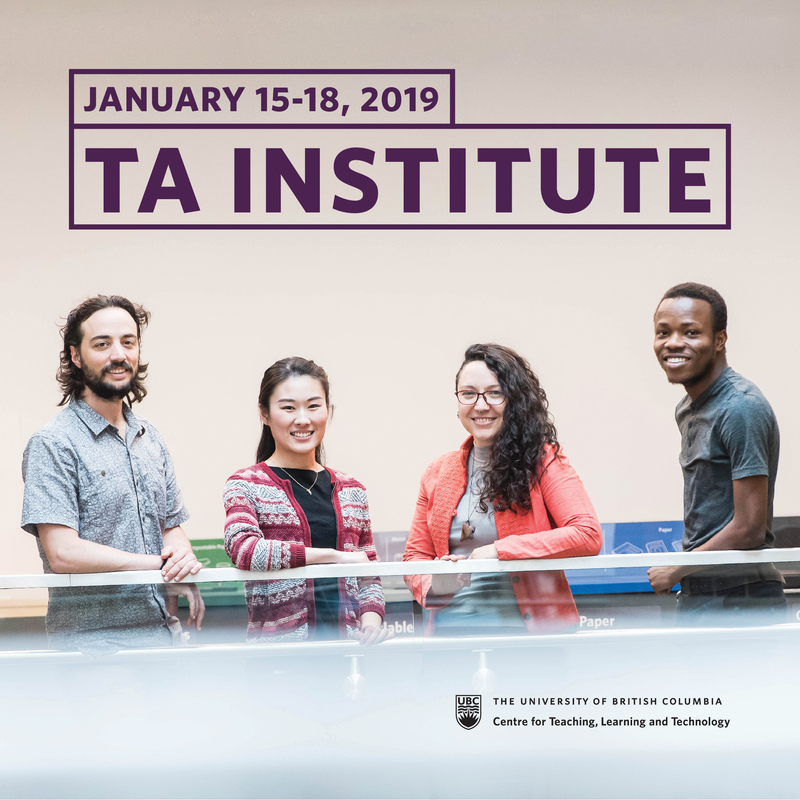 As you may know, all graduate students at UBC can attend the very popular Instructional Skills Workshop (ISW) at the Centre for Teaching, Learning and Technology (CTLT). Usually the workshop has a very long waitlist and is difficult to get into. LFS has secured spots for teaching assistants (each valued at $200) which allows you to bypass the waitlist. We have nine spots remaining. Your name, graduate degree program and courses you are currently or intend to TA/teach. A brief description of how the ISW contributes to your teaching development (150 words). As always, do get in touch if you have any questions or concerns.